An inventory and map 1796 of Walcot properties shows the reference (Gf) for the position and name of “house, garden & close, formerly the Swan Alehouse “ where John Sayce is tenant paying £8 yearly. This is the location of the current Six Bells Inn, which indicates that pubs moved premises over the years. 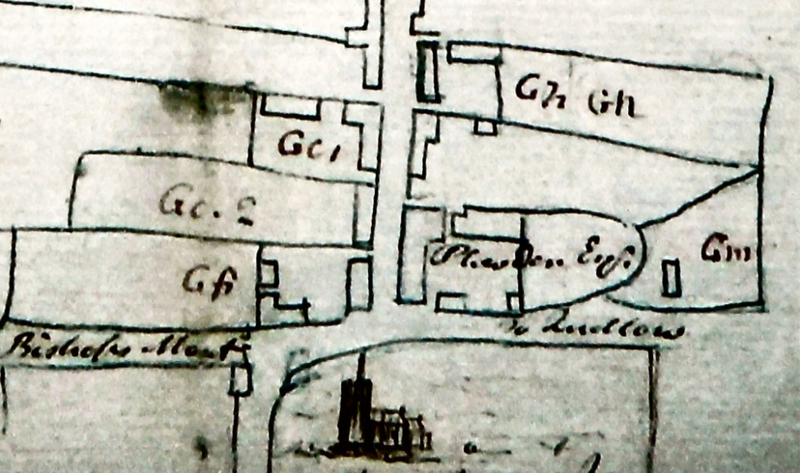 On the same map, The Bell Alehouse is shown on the other side of the road at 8 – 10 Church Street, with John Farmer as the tenant. A later map (1848) shows the Old Swan at 14 Church Street. Research ongoing. Do you have any information or pictures of any of the pubs of Bishop’s Castle? We’d love to hear from you. Contact us here. Map and text images reproduced with the consent of the Trustees of the Powis Castle Estate.